Portable digital studios keep getting smaller and keep getting cheaper. The latest entrant is the Zoom MRS4, a four-track digital studio with a footprint about half the size of your favourite recording technology magazine. 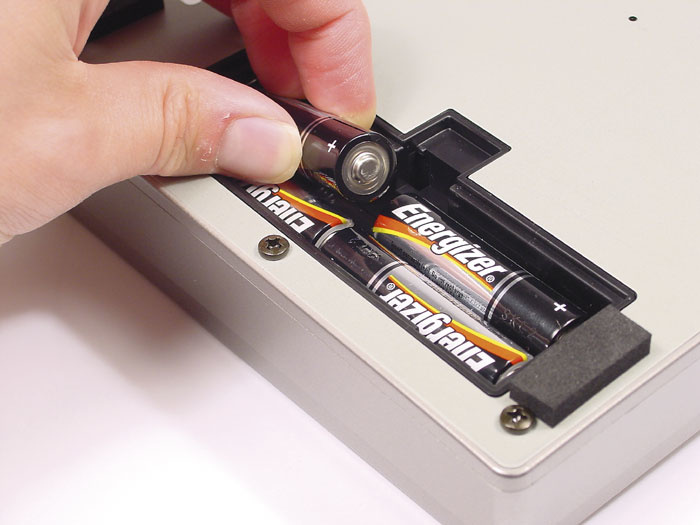 The MRS4 can be run from batteries, records onto Smart Media cards and is priced alongside the better cassette-based multitrackers. The Zoom is up against a number of other portable, Smart Media-based multitracks. For example, Zoom's own PS02, the Boss BR532, Tascam's Pocketstudio 5 and Korg's PXR4 have all been reviewed by SOS over the last couple of years (see the Review Round-up box for details). The Smart Media format means data compression is involved, but the quality of the finished recordings can be perfectly acceptable for demos or mixes aimed at delivery via the Internet. So, if you are looking for a portable digital multitrack for songwriting or demo purposes, how does the baby of Zoom's MRS series fare? The physical layout and operational procedures of the MRS4, while obviously slimmed-down, are similar to the other multitracks in the MRS series, including the MRS802 reviewed by Paul White in the July issue (www.soundonsound.com/sos/jul03/articles/zoommrs802.asp). The MRS4 provides four-track playback and can record two tracks simultaneously via the two quarter-inch input jacks. Each of the four tracks also offers eight virtual tracks that can be used to hold alternative takes or for track bouncing. Unlike the MRS802, however, there are no built-in rhythm functions other than a metronome. In keeping with the portable ethos, the MRS4 can be powered from four AA batteries. Two RCA jacks supply the main outputs and a second pair of quarter-inch jacks provide an Aux In. The signal from these is passed directly to the outputs, so they cannot be used as additional inputs while recording. 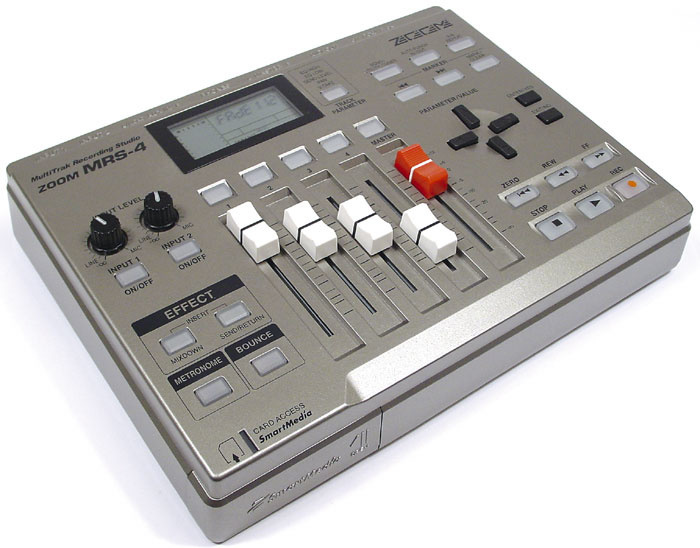 They could, however, be used to pass the output from a drum machine to a monitoring system or master recorder, and the MIDI output of the MRS is intended to provide sync for just such an application — and if you need a suitable drum machine, Zoom will be happy to interest you in their new MRT3 Rhythmtrak. A headphone output is also provided. Audio quality can be set at either Hi-fi (32kHz) or Long (16kHz). In Hi-fi mode, the supplied 32MB Smart Media card provides 17 minutes of track time (that is, just over four minutes of four-track recording), so you might just squeeze in that three-minute tune plus a stereo mix bounced to a pair of virtual tracks. As with the other MRS-series recorders, all the user feedback is provided via the LCD and, while some functions require a little bit of cursor control, it is not that much of an ordeal to set up things like track EQ, pan or send effect levels. Audio editing functions such as copy and paste are a little more involved (and certainly harder work than on a computer-based audio sequencer) but no worse than on any other unit of this type. A mains adaptor is provided, but battery life from four AA-sized batteries is very good. The only other issue is data backup: as there is no USB out, a computer and Smart Media card reader are pretty much essential, although if all that is needed is data archiving and a spot of CD burning, the computer need not be of the latest specification. Unsurprisingly, given that the MRS4 is pretty much a 'no frills' device, operation is very straightforward. Recording simply requires plugging in, switching on the input, setting the input level and then record-activating the required track by pressing the appropriate button above the channel fader. This is barely more complex than on a cassette-based multitrack and, as the manual provides a step-by-step guide, even the novice user ought to be up and running in a matter of minutes. Two tracks can be recorded simultaneously, and an additional pair of input jacks allows you to play along to a drum machine or sequencer.In Hi-fi mode, the recording quality is surprisingly good. Subjectively, it is both less hiss-prone and clearer than on a cassette-based unit, and very respectable demo recordings are therefore possible with the MRS4. The possibilities are enhanced further by the now-familiar virtual track system, as track bouncing is all done in the digital domain and, with a little forward planning, the original recordings can be retained on a virtual track and remixed latter should the need arise. Long mode doubles the recording time available and is absolutely fine for sketching out song ideas but the audio naturally lacks top-end sparkle compared to Hi-fi mode. In use, perhaps the most obvious corner that has been cut in keeping the cost of the MRS4 down is in the internal effects. While the two-band EQ is respectable enough with both gain and frequency controls, the Insert, Send and Mixdown (applied to the stereo output) effects are pretty limited compared to the more upmarket MRS-series units. For example, the Insert effects offer a choice between a Limiter, Compressor, Cabinet Simulation and various Microphone processors, but each has little in the way of editable parameters. The Cabinet Simulator is a simple choice between three types — Combo Amp, Bright Combo Amp and Stack Amp. There are none of the guitar or bass multi-effect algorithms found on units like Zoom's PS02 or MRS802. If you already own an amp modeller or are happy to mic up a real amp (shock horror! ), then this is not a problem. However, if you really want all these functions in a single studio box, then something a little more expensive than the MRS4 is required. The Send effects include delays, reverbs and chorus but, again, aside from send levels from each track, there is little user control. The reverb is pretty basic and certainly needs to be used fairly sparingly. As the MRS4 is 'audio only', it differs from the other Smart Media 'pocket' studios mentioned earlier. Bar the excellent virtual track system that really does expand what is possible (but is also found on some of the competition), the MRS4 has perhaps the most streamlined feature set, with no built-in rhythm or bass parts, no USB out and limited internal effects. It is also, however, the unit with the lowest suggested selling price and, for what it is designed to do (audio recording), it is actually pretty good. As long as I had access to a suitable computer for data backup, I'd certainly pick the MRS4 over a cassette-based unit. Respectable audio quality in Hi-fi mode. Very portable with good battery life. Backup requires a suitable computer and Smart Media card reader. The Zoom MRS4 is capable of very respectable four-track recordings and is also extremely portable with good battery life. If you don't need built-in drums and comprehensive amp modelling, then the MRS4 is currently the cheapest of the Smart Media multitracks and would make an excellent tool for the mobile songwriter.